PropertiesWeight30 (gms)Dimensions10.4 (cm) x 0.1 (cm) x 13.4 (cm).. Style your hair with Vagad's Khadi Burgundy Mahendi Powder. 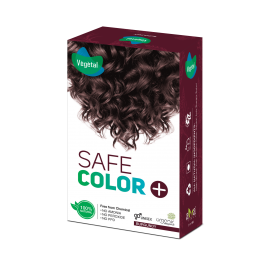 It gives natural looking burgundy color ..
Vegetal Bio Colour - BURGENDYNo PPD No Ammonia No Hydrogen Peroxide For Men & Women.. The Safest Way to Color your Hair…Key Features· Made out of 100% natural herbs and ex..
Added goodness of henna, Amla, Shikakai, & Bhrinaraj for total grey coverage. Sunny herbals hair..
Indus Valley Organic Burgundy Gel colour uses revolutionary PHAB free technology (i.e. free from PPD..
“COLOUR-ME-ORGANIC”, an organic hair color dye, which is a perfect blend of rare hair treatment herb..
Vegetal Bio ColourNo PPDNo AmmoniaNo Hydrogen PeroxideVegetal Bio C..
Indus valley Organically Natural Gel Burgundy 3.6 hair color is 100% herb based hair color which hel..